President Donald Trump said in a tweet Tuesday night that without a southern border wall, there would be "no DACA" as part of an immigration agreement. Mocking "Cryin' Senate Minority Leader Chuck Schumer (D., N.Y.), Trump responded to Schumer threatening to withhold wall funding as part of a bipartisan immigration deal. 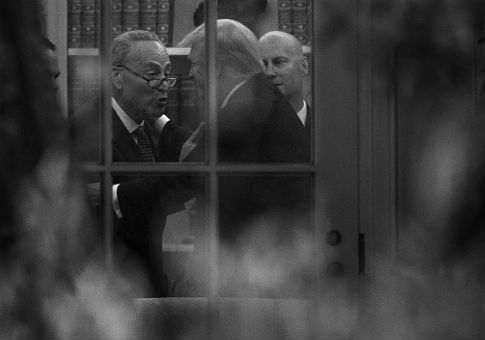 In Schumer's telling, during negotiations before the brief government shutdown forced by Senate Democrats over the weekend, he offered Trump well north of the $1.6 billion originally requested to build the wall in exchange for protecting the hundreds of thousands of "Dreamers" protected by DACA (Deferred Action for Childhood Arrival) from deportation. The deal fell through, however, and Schumer now says the wall is no longer on the table. "Cryin' Chuck Schumer fully understands, especially after his humiliating defeat, that if there is no Wall, there is no DACA. We must have safety and security, together with a strong Military, for our great people!" Trump wrote. Building the wall would be a fulfillment of one of Trump's most famous campaign promises, although he frequently said that the wall would be paid for by Mexico. The shutdown ended after less than three days on Monday when 33 Democrats joined almost all Republicans in passing a stopgap spending bill to fund the government through Feb. 8. In exchange, Senate Majority Leader Mitch McConnell (R., Ky.) promised to allow an immigration bill to be brought before the chamber before then. Like the continuing resolution Democrats blocked on Friday, it had a six-year extension of the Children's Health Insurance Program and no provisions regarding Dreamers, leading to charges the minority party "caved." Left-wing advocates and House Democrats blasted Schumer for ending the shutdown without getting protections for Dreamers in the bill, although Schumer has said he got the best deal he could under the circumstances. UPDATE: 11:05 P.M.: This article originally defined "Dreamers" as DACA recipients. However, the term "Dreamers" is a more general term for immigrants brought to the U.S. illegally as children. There are approximately 800,000 "Dreamers" who have joined the DACA program. This entry was posted in National Security and tagged Chuck Schumer, DACA, Donald Trump, Illegal Immigration, Immigration Reform. Bookmark the permalink.